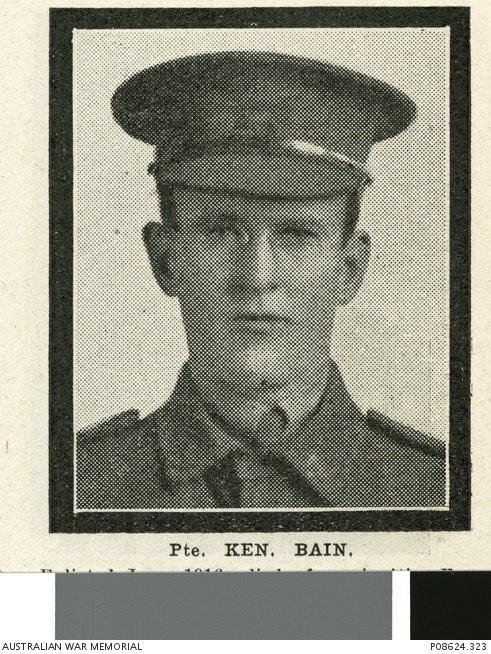 Studio portrait of 5976 Private Kenneth Bain, 2nd Battalion of Annandale, NSW. A grocer prior to enlisting, he embarked from Sydney aboard HMAT Wiltshire (A18) on 22 August 1916. On 2 January 1917, he was admitted to the No 25 Stationary Hospital, Rouen, France with tubercular meningitis and died of the disease in hospital on 8 January 1917, aged 21. He is buried in the St Sever Cemetery Extension, Rouen, France. I don’t know if he had any children, but possibley had a brother Robert Bruce Bain. Robert was killed in action, he was 24 years old. The Hunter Baillie Presbyterian Church in Annandale, Sydney, has the two Bain,s names on the church War Memorial Boards in the foyer of the church.